Eid Mubarak! 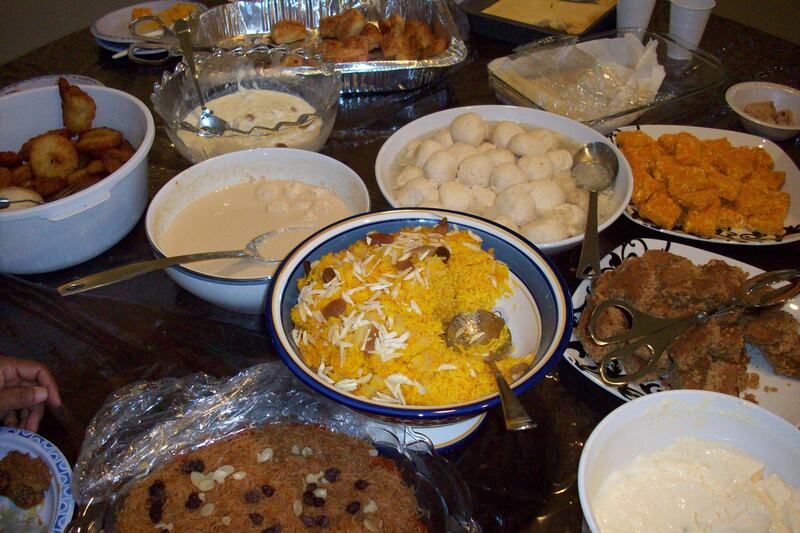 Monday marked the end of pilgrimage for millions of Muslims in Mecca, and here at my home we celebrated the only way Bengalis know how to celebrate – with Bengali sweets. The table was heavy with juicy plump roshugullahs, creamy shemi, sweet gager halwa, and moist pistachio burfi. And of course, pecan pie. With mishthi fresh on my mind, my ears particularly perked up this week when I heard on NPR a story about how a couple of food scientists played with making the classic birthday cake better. 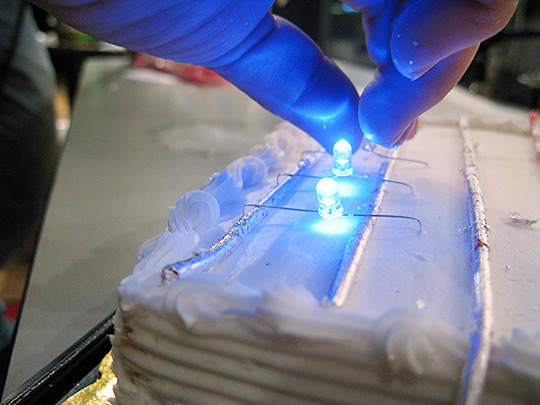 An electrified, edible birthday cake with LED light bulbs instead of candles is just one of the concoctions that Patrick Buckley and Lily Binns have dreamed up for The Hungry Scientist Handbook. The wiring is edible, but Buckley says figuring out how to make it wasn’t easy. Have you guessed the desi angle yet? Eventually they settled on Twizzler Pull-n-Peel licorice rolled in varak, a silver foil used as a garnish in Indian cooking. The foil is edible, Binns says, but only in small amounts. The perfect desi-American fusion mishthi. For nerds.I remember when I was a little kid and my mother told me the shiny surface to mishthi was made of real silver. At that moment, I thought being Bengali was so cool, because those other kids, they might have had their chocolate icing. But where I came from, our icing was decadently made of real silver. After I learned this tidbit, I cherished my sweets all that much more, slowly peeling off the varak and saving to eat it last. Where does this silver delicacy come from? The authors of The Hungry Scientist Handbook have a blog where they source the silver all the way to Lucknow. Quite innovative, those hungry scientists. Their blog has recipes for bacon chocolate, dry ice drinks, and alcoholic ice cream. They take the term ‘playing with your food’ to a whole new level. How do you play with your food? This entry was posted in Food by Taz. Bookmark the permalink. “sweet gager halwa” wtf!!!?? ..ooohh dat must b amriki for “gaajar”.. If you ask any Indian from Mumbai who has come to the U.S. in the last 6-8 years they’ll tell you that no one makes the varak that way anymore. I’m starting to get suspicious of this view as it seems that anything that is talked about on this blog doesn’t actually happen in India according to certain sources.